Paris Mayor Plans To Eliminate All Non-Electric Cars By 2030 : The Two-Way "We are seeing a revolution in terms of mobility and on the issue of climate," said the city's deputy mayor. "We can't wait." Mayor Anne Hidalgo has called for an end to gas-powered vehicles in Paris by 2030, in favor of biking, transit, and electric cars. 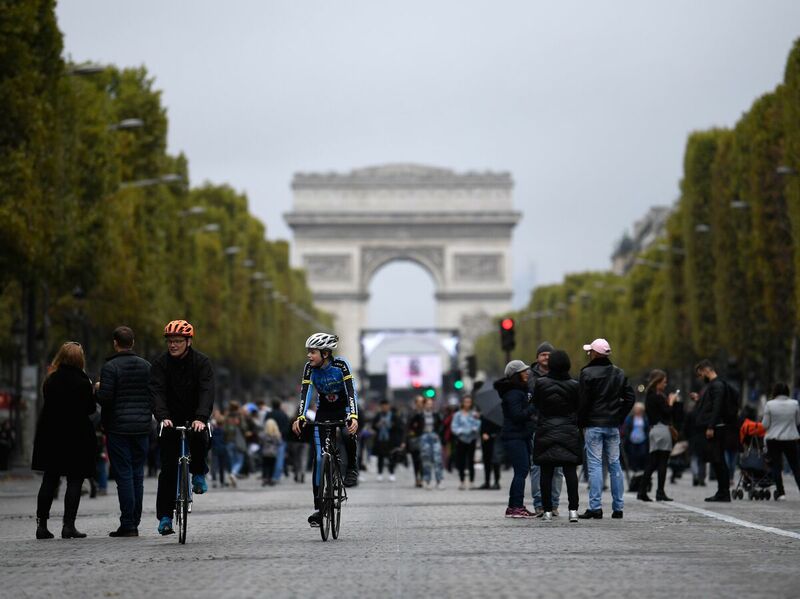 Here, cyclists and pedestrians on the Champs- Élysées during the city's "day without cars" on Oct. 1. If the mayor of Paris holds sway, gas-powered cars will be gone from her city by 2030. Instead, citizens will get around via public transport, bicycles, and electric cars — and Paris will be on its way to carbon neutrality by 2050. Mayor Anne Hidalgo's call on Thursday for an end to petrol-fueled cars on Paris roads by 2030 follows a previously announced plan to eliminate diesel cars from the city by 2024, when Paris will host the Summer Olympics. "We are seeing a revolution in terms of mobility and on the issue of climate," Christophe Nadjovski, Paris deputy mayor in charge of transport and public space, told France Info Radio on Tuesday. "We can't wait." The mayor's office released a statement clarifying its aims after news outlets reported that the city was banning gasoline cars. "No measure of prohibition or sanction is included" in the new climate plan for Paris, the mayor's office said in the statement. "In order to achieve the goal of an end to the thermal engines in 2030, the City has decided to invest in the development of alternatives and in the reinforcement of financial aids that allow individuals and professionals to buy clean vehicles." The climate plan will be submitted to the Council of Paris for a vote in November. The city's statement emphasized that it was going to make the transition easy for its citizens, pointing to recent announcements by automakers to gradually stop producing gas and diesel cars. It also touted its investments in public transit and bike lanes. Authorities say that more than 60 percent of Parisians don't own a car. In July, France's environmental minister Nicolas Hulot announced that the country planned to ban the sale of petrol- or diesel-fueled cars by 2040. He said the country intends to be carbon neutral by 2050, a decision he linked to President Trump's decision to withdraw from the Paris climate agreement. Hidalgo has already implemented a number of measures to reduce air pollution from cars. After an atmospheric phenomenon known as inversion occurred last March, "the pollution levels in Paris briefly topped those of Beijing," NPR's Eleanor Beardsley reported. As a result, the city temporarily alternated between banning cars with even- and odd-numbered license plates. In July, Hidalgo banned cars built before 1997 from driving in the city during daylight on weekdays. A few months later, Paris converted the lower quays along the Seine from motorways into promenades for pedestrians and cyclists. Though advocates for car owners have criticized her initiatives as being hostile to the working class, the Socialist mayor is intent on pushing her city's residents to get used to being less reliant on motor vehicles. On Oct. 1, the city held "a day without cars," with the intention of making Paris "less polluted, more pleasant and more peaceful." Nitrogen dioxide levels dropped 25 percent, and noise levels dropped an average of 20 percent. On the Champs-Élysées, noise levels dropped 54 percent. "Sensitizing residents to the need to modify their behavior towards the car was part of the objectives of this day," the mayor's office said in a statement, adding that it was also meant to be a symbol "that cities can and must invent concrete solutions to fight air pollution caused by traffic."